Sprüth Magers, Los Angeles, is pleased to present Folds and Faults, an exhibition of new work by Analia Saban that extends the artist’s experimental, witty, and profound exploration into the ways in which artworks both enter into being and enter into dialogue with the world they inhabit. 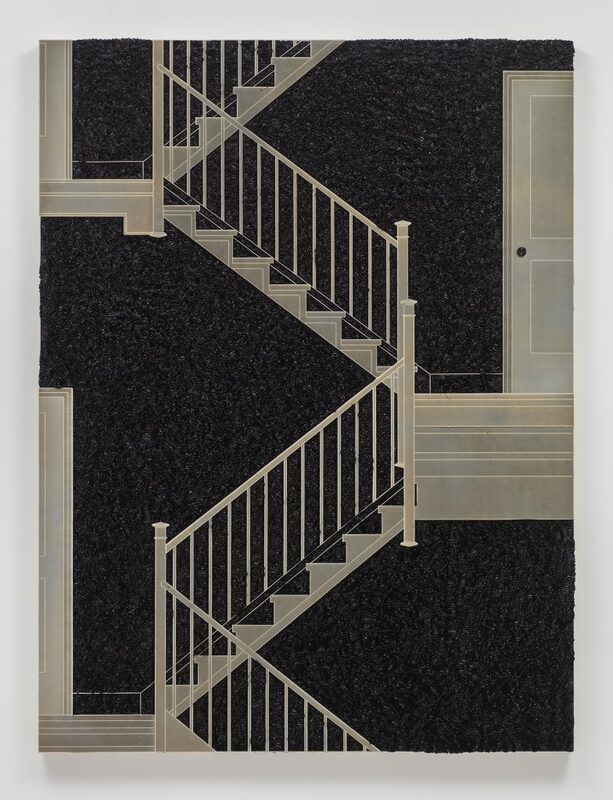 Across four recent series, the artist weaves together—literally, at times—medium and content, folding art and architectural references in with everyday concerns that range from light-hearted investigations to meditations on mortality. As in past works, Saban’s new series are deeply engaged with the basic tools of art-making: while she uses traditional materials such as paint, linen, wood, ink and paper, she turns onto its head our concept of what a painting, sculpture or drawing entails. In the exhibition’s title, Saban borrows the idea of the fold, in part, from philosopher Gilles Deleuze, whose writings describe the cosmos as an “origami universe” that is forever expanding and unfolding; this process also mirrors our own continual folding of the external world into our interior, subjective experience and self-image. This is a deeply connected and elastic view of reality; yet one riven, too, with faults that have the potential to crack and swallow us whole. As an artist based in Los Angeles, one of the earth’s earthquake capitals, Saban’s perpetual awareness of impending fracture, destruction, and demise carries over into her work, albeit in an oblique and even sometimes playful manner. 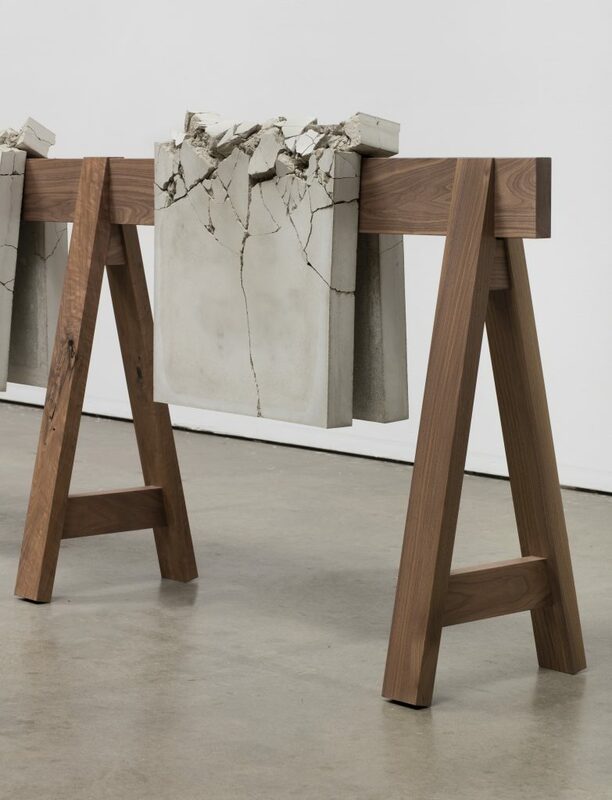 The artist’s recent concrete sculptures, for example, involve actual folds and faults reminiscent of aging, crumbling structures. To create them, Saban worked closely with engineers to develop a method of folding slabs of concrete, going entirely and wryly against what the substance was intended to do as a standard construction material. Her resulting works are creased in patterns that mimic printers’ paper-folding techniques (gate fold, accordion fold, etc. ), and they sit and drape improbably atop hand-crafted walnut sawhorses and shipping pallets. The beauty of the wood contrasts with the deteriorating concrete, making the work at once attractive and absurd. 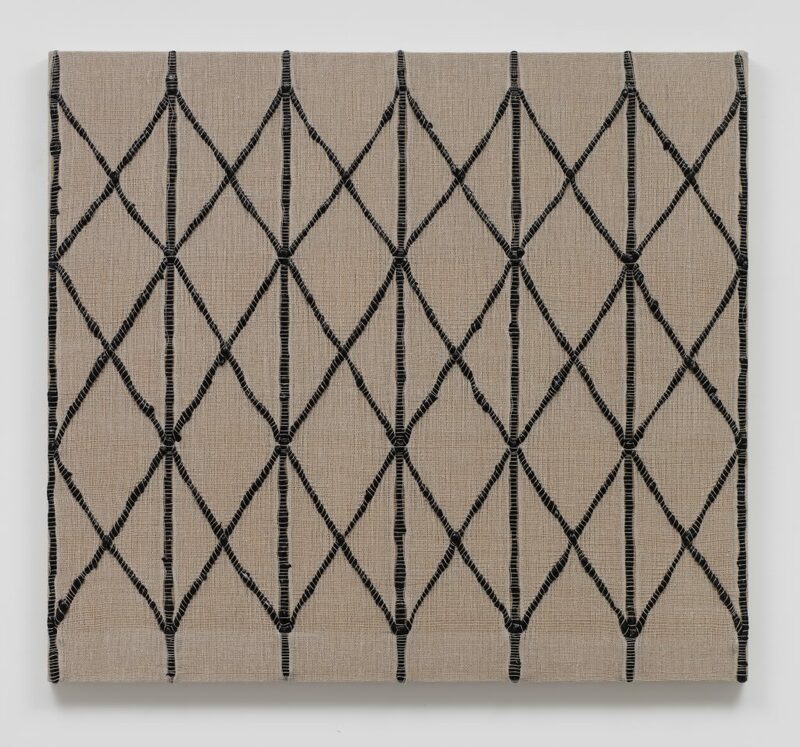 Saban’s undoing and reconfiguring of mediums continues in her series of weavings. 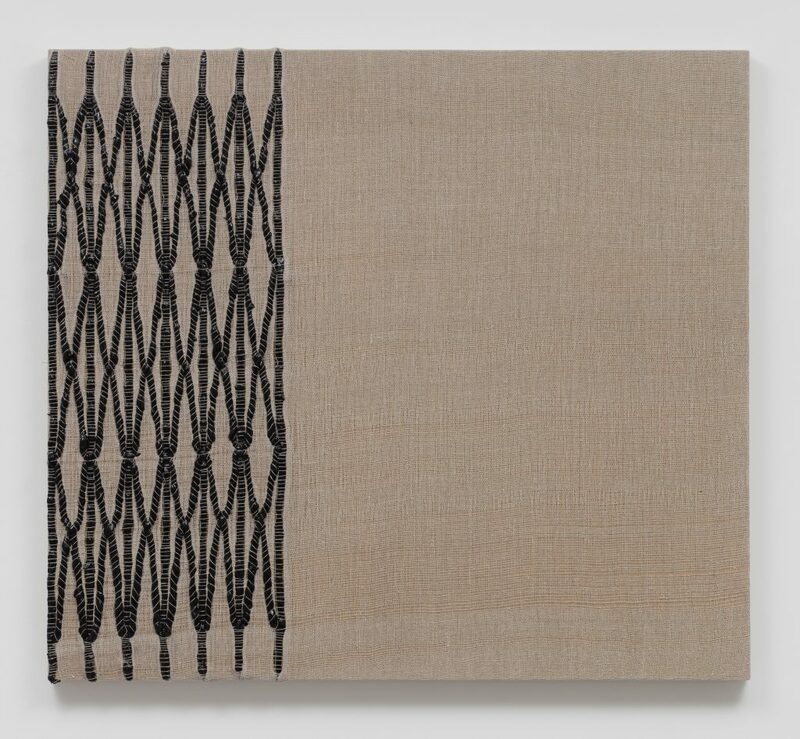 Each painting has been woven by hand on a traditional loom; as the linen canvas materializes, networks of dried acrylic brushstrokes are entwined throughout its warp and weft. 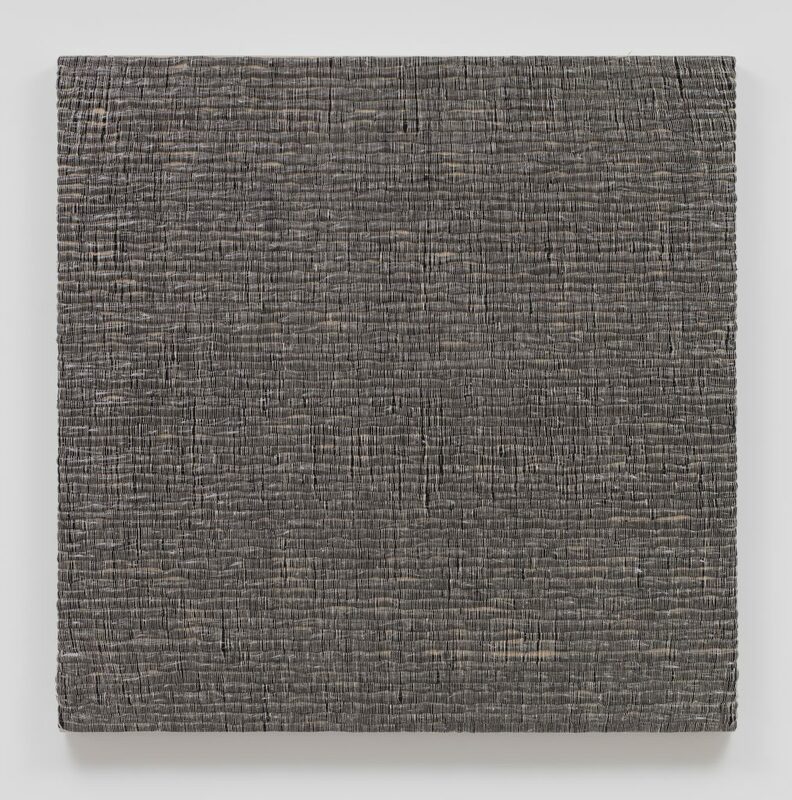 On the one hand, the monochromatic lines and shapes that populate these works share the minimalist impulses of painters such as Sol Lewitt and Agnes Martin. On the other, they subvert the established notion of painting as paint-on-canvas by inventing what is essentially paint-within-canvas, and creating objects that hover between painting and sculpture. The works’ geometric patterns also coalesce gradually into recognizable forms, such as window frames, doorways, and the protective accordion-style gates seen across Los Angeles and other cities. What begins as an ingenious artistic flip evolves into an exploration of the porous boundaries between artworks, objects, architecture, and daily life. Saban’s group of large paper-on-ink panels, depicting the interiors of a home, enact a similar media reversal. She produces them by layering thin, laser-sculpted pieces of paper onto fields of pitch-black ink. As the paper hits the still-wet ink, its translucence builds, sometimes to the point of splitting and disintegration. And as the ink dries—sequestered into pockets that form staircases, venetian blinds, and plant pots—it gains a rough wrinkled skin that conflicts with Saban’s careful, diagrammatic architectural compositions. The domestic scenes in these works are entirely familiar, but their unusual process creates a strong sense of tactility and intrigue. Moreover, it is a telling coincidence that in Deleuze’s writings, he used the metaphor of a two-story house to illustrate his theory of the fold and subjectivity. Finally, a new suite of photographic inkjet prints once again confounds ideas about how art mediums are supposed to function. Across the walls of the gallery’s second floor, we witness the slow coming apart of a linen canvas, its threads gradually unwoven by an unseen hand. The photographs look uncannily real, tempting viewers to reach out to pull the loose strands themselves. They are printed onto meticulously prepared “sheets” of acrylic paint, which are created by drying thin layers of white paint, building them up gradually until they are thick enough to support the printing process. These and Saban’s works throughout the exhibition move the viewer in and out of states of contemplation, incredulity, and pleasure that are indicative not just of Los Angeles’s shifting grounds, but those of today’s anxiety-ridden planet. While art can offer respite from the external world, Saban’s materially rich and alluring objects keep turning us back, folding us outside the gallery and into reality.